Urban Survivalism or What would MacGyver do? British summertime is here and with it much loved events that are practically institutionalised in the calendars of the stiff upper lippers: Test Matches, Wimbledon, Queen’s Club, Highland & Yorkshire Shows, and the much loved Glastonbury Festival. An important element of British summertime is ‘braving the weather’ (closely followed by 'talking about the weather’). There are some nice places in the world, where this means exceptionally hot weather around this time of the year. At the European Games 2015 in Baku we hit 42 degrees on quite a few days, which posed challenges in looking after our staff and customers. At the Olympic Stadium our colleagues from the local police, for instance, insisted on wearing their full black uniforms in all temperatures to show their professionalism and authority. As much willpower as they showed, we are all human, and I take my hat off to them for putting themselves through this. In the UK our challenges around this time of the year are sometimes quite different. In the UK ‘summertime' often means days of torrential rain. And this aspect of British summertime has given rise to a phenomenon that is quite unique - I call it 'Urban Survivalism'. This is characterised by patrons of events - inspired by my recent trip to Glastonbury - telling each other ‘how to survive’ the event, and treating a visit to a festival as something of a challenge that can only be overcome as part of a collective effort and a great deal of inventive spirit. Not only is spectator survival an important factor in return custom for any event organiser, this specific angle (survival) is uniquely counter-intuitive as one normally organises events in such a way that they do not constitute an encumbrance to the paying customer. The Urban Survivalist however is looking for hardship as a form of entertainment, a suffering that validates them as a ‘proper’ festival-goer, if they walk back into their home on their own two feet with all limbs still intact (or at the very least those they originally started out with still attached). 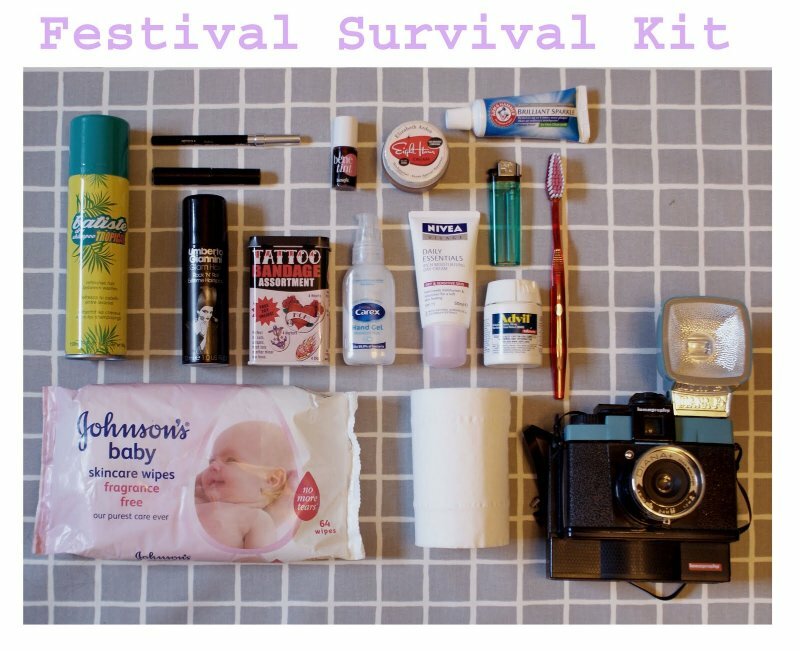 The general themes found on festival survival websites range from battling the weather, use of toilets, keeping tanked up (i.e. how to keep a steady level of intoxication for the best possible value) to the mechanics of keeping tent and belongings dry, and how to keep non-muddied belongings apart from muddied belongings (What would MacGyver do?). The latter is incredibly hard, as mud and desert sand are essentially the same thing in different aggregate states - they end up everywhere, and any attempt to make it better actually makes it much much worse. My backpacking days were characterised by my motto “What would MacGyver do?”. In other words, improvisation and invention. For those who have not been party to US television in the 80’s, MacGyver is a fictional character. He is my hero because he could solve any problem with non-violent means and a stick of chewing gum, he was handsome and he could make incendiary devices out of practically anything. If you are 10 years old incendiary devices are a good thing - and I learnt a great deal about health and safety by making my own. In my time backpacking days, I manufactured complex contraptions to keep mosquitoes at bay, and found new and innovative ways to catch critters within sleeping accommodation, or make light in the same without burning it down (in the absence of electricity). So my heart goes out to all those who were stuck in traffic to get to Glastonbury, stuck in mud whilst on site (I might have helped a few out of it) and stuck in more mud in car parks on the way out. You paid for it, and you will remember how you lived to tell the tale for a lifetime after. 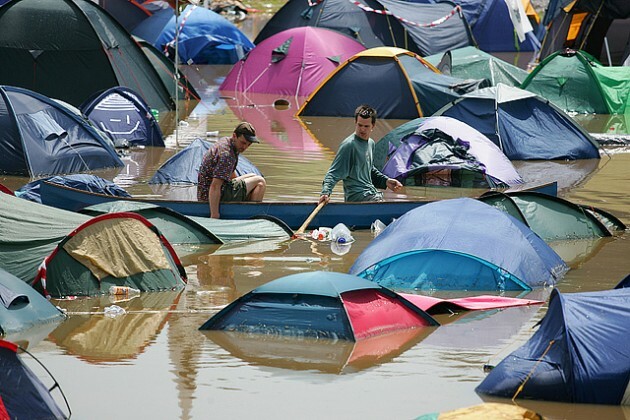 In 2005 the weather at Glastonbury was reportedly so bad that people were going round parts of the site in canoes. Far from being off-putting, 2005 is a firm part of festival folklore. The phrase “rose-tinted glasses” springs to mind. Wednesday’s traffic meltdown in Somerset reminded me of something that Professors John Drury and Chris Cocking had recently lectured about: social identity in crowds and collective resilience. These learned people say, that where there is a shared social identity in the crowd (in this case music lovers on route to the world’s best festival plagued by changeable weather), there is shared understanding, a positive atmosphere where people feel they can talk to strangers more easily, mutual social support, and a coordination of actions. Indeed, local communities came out to support those stranded on the roads, providing hot drinks, toilets and so forth. What would otherwise be perceived as a terrible ordeal was made bearable by the feeling of being stuck TOGETHER. It remains to be seen, whether there will be such a thing as A37 babies in about 9 months’ time. It seemed to me that social identity was positively affirmed through having overcome the awful conditions both on the road and on the site COLLECTIVELY. People will talk about the things they did in those 14 hours confined to a static spot somewhere in Somerset for years to come because they experienced them with their friends. General crowd resilience is somewhat expected at festivals - meaning that the organisers are assuming that their customers are reasonably competent in preparing for the event (i.e. bring the right equipment) and can be trusted to cooperate when things on the site deteriorate. They are also trusted with the truth, apart from the fact that the truth in a bad weather situation is mostly blatantly obvious. 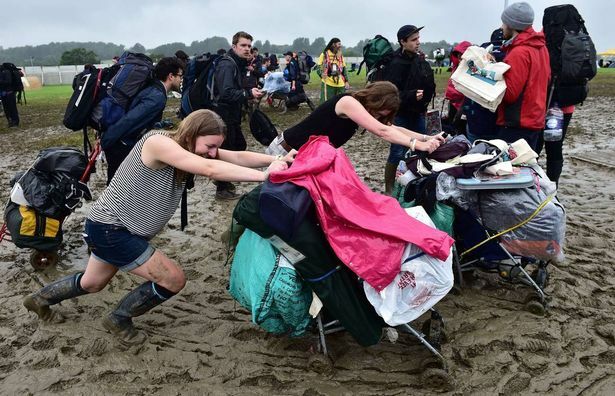 There are three important aspects to collective resilience that all event organisers should consider, and that we can all learn from Glastonbury: relationships, trust and information. As a matter of fact, social norms have a much greater influence on people than market norms. If my relationship with an event is only defined by having paid my money and getting what I paid for, it is unlikely I will sit in 14 hours of traffic willingly. People are more likely to tolerate adverse conditions and cooperate, where there is a heartfelt connection. On Wednesday I truly realised how this works. To facilitate collective resilience and use it to an organisation’s advantage it is important to foster trust between the organisation and the customers, and to clearly communicate information in emergencies. I have often been involved in events where the organisers were hesitant to be transparent about challenges and issues during the event for fear of being perceived as incompetent, or even worse, in case panic broke out. But the greatest test of one’s competence is probably to find a way to communicate a shortcoming or emergency and use honesty to one’s advantage. To use it in such a way that enhances shared social identification and to make the public a resource in an emergency. Drury states that, in order to achieve this, you have to firstly trust that the crowd can actually self-organize. Secondly, you must communicate practical information. And, thirdly, you must encourage ownership and empowerment. 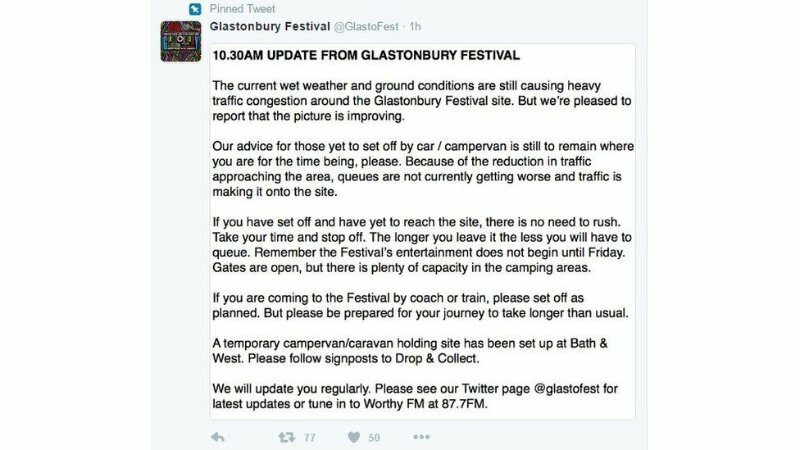 The tweets and press releases from the Glastonbury organisers achieved just that in my opinion. They certainly delayed my departure. I made sure I had checked the latest news before setting off. The Urban Survivalist is a competent customer - albeit it might not seem that way, when we see pictures of twenty-somethings with wheelbarrows and pallets of cheap cider. Event Health & Safety can take a leaf out of the survivalists’ book and be more empowering to customers and less assuming of their ignorance or incompetence. There is nothing worse than having to explain to a customer who is making a reasonable enquiry as to the reason for a policy “It’s for Health & Safety”. And what would MacGyver do? He would say “Girls! Two wheels work better than four in the mud”. Movement Strategies have provided services to Glastonbury Festival since 2007. 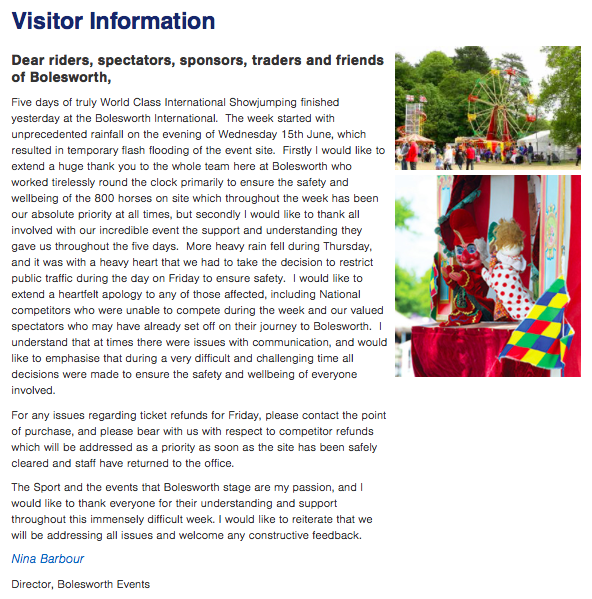 As part of the festival's programme of continuous improvement, Movement Strategies undertakes risk assessments, crowd safety and visitor experience audits at each Festival, helping to improve safety during the event and refine the site design for the following year.